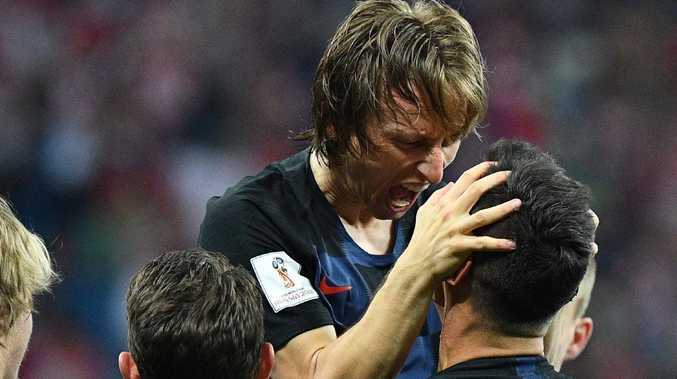 Luka Modric will have a vital role to play against the Russians. Picture: AFP. CROATIA'S 1998 bronze medallists are regarded as the country's golden generation, but Luka Modric's class of 2018 has the potential to surpass them. Standing between Croatia and a semi-final berth is a Russian team running on adrenaline and buoyed by a partisan home crowd, as will be the case in Sochi on Sunday morning (AEST). The 1998 team made a quarter-final statement, sending German football into a spin with a 3-0 win and they were 1-0 up against hosts France in the semi-final before losing 2-1. Ex-Real Madrid striker Davor Suker won the Golden Boot while captain Zvonimir Boban (AC Milan), Robert Prosinecki (Barcelona and Real Madrid), Robert Jarni, Slaven Bilic (West Ham) and the underrated Aljosa Asanovic (Napoli) were part of the rock-star squad, which was missing injured superstar Alen Boksic. Real playmaker Modric is the 2018 pin-up boy, with Ivan Rakitic (Barcelona), Ivan Perisic (Inter Milan), Mario Mandzukic (Juventus) and Dejan Lovren (Liverpool) part of the big-club batch of players. Russia stars Yuri Zhirkov and Alan Dzagoev are in doubt for the game, but they have ace Denis Cheryshev up their sleeve after he came off the bench in the shoot-out win over Spain at Lukhniki Stadium. Attacking ace Aleksandr Golovin, 22, has been a revelation, with his mum revealing that Chelsea and Juventus are tracking him.